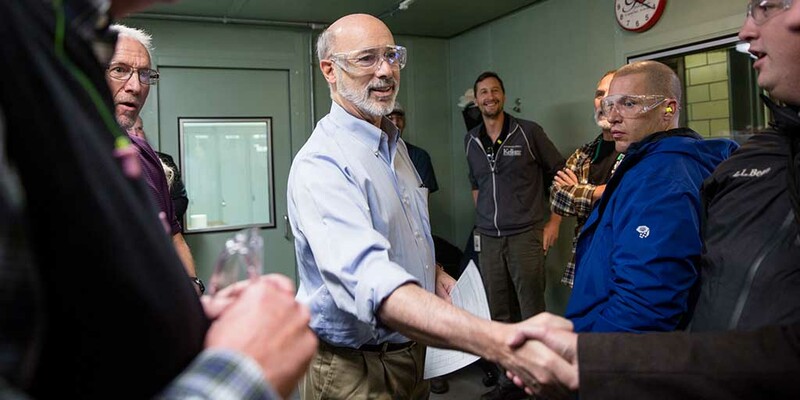 Harrisburg, PA – Today, Governor Tom Wolf announced Spartan Motors, Inc., will be leveraging the highly skilled workforce of Ephrata, Lancaster County, by expanding and creating nearly 200 new jobs at its truck body manufacturing facility. Spartan Motors, a provider of specialty chassis and vehicle design, manufacturing, and assembly, plans to expand its current site in Ephrata to fulfill a recently-awarded contract from the United States Postal Service (USPS) to manufacture cargo body vehicles for parcel delivery. The 2,000-vehicle, $214 million USPS contract award, the largest single order in Spartan’s history, required the company to look outside of its Michigan and Indiana fleet vehicle manufacturing facilities to accommodate the large order. Spartan chose to upgrade its existing Ephrata, Pennsylvania location and leverage a highly skilled workforce while expanding its East Coast operations. In so doing, Spartan will invest at least $2.4 million into the project, which will result in the creation of 189 new, full-time jobs and the retention of 76 existing jobs over the next three years. Spartan received a funding proposal from the Department of Community and Economic Development for a $300,000 Pennsylvania First grant and $378,000 in Job Creation Tax Credits to be distributed upon creation of the new jobs. The project was coordinated by the Governor’s Action Team, an experienced group of economic development professionals who report directly to the governor and work with businesses that are considering locating or expanding in Pennsylvania, in coordination with the Economic Development Company of Lancaster County. “Spartan Motors’ decision to invest in its Ephrata facility with a new production line, and a complementary use to its existing Emergency Response division already located here, is the type of business investment that we value and that helps drive our economy forward,” said John Biemiller, director of business retention and expansion at Economic Development Company of Lancaster County. Spartan Motors (NASDAQ: SPAR) was founded in 1975 by a small group of automotive engineers and has grown into a global vehicle-specific design, engineering, manufacturing, assembly, and service company. Spartan is diversified into three business units, including Spartan Fleet Vehicles & Services, Spartan Emergency Response, and Spartan Specialty Vehicles. Together, they produce more than 22,000 units annually, and employ over 2,300 associates in seven states and three countries.